After what feels like months of rain and wind, it has finally stopped… WE.HAVE.SUNSHINE! *touches wood* Dare I say, there's even a little warmth in that sun! 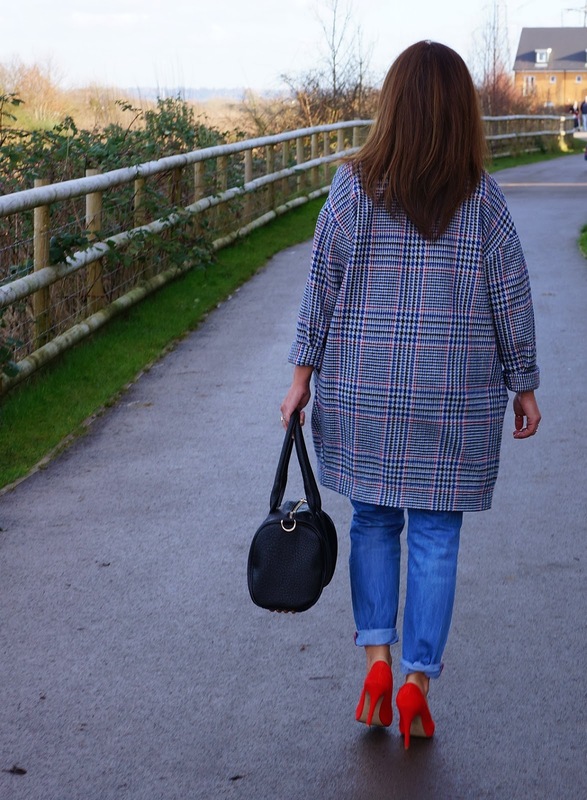 Dry weather means I can drag out the red suede pumps that have been hiding from the puddles and the coatigan that lacks practicality in storms…This is quite possibly my favourite styling at the moment, oversized coats, slogan tees, denim and some colour splash heels...Smart casual happiness! 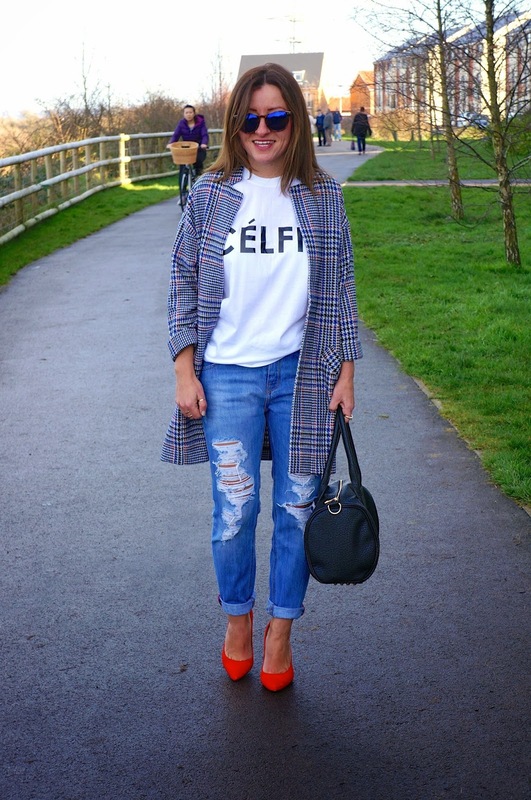 Jeans - Boyfit from Mango last AW Bag - Portmans in Oz Coatigan - ASOS petite last year as featured here. Heels - Office last AW Tee - Celfie from Sincerely Jules. Wool Coat - H&M, buy here. Tee - River Island, buy here. Red Pumps - Office, buy here. Jeans - River Island, buy here. Bag - Alexander Wang Rockie, buy here. Are the sunnies new? They're ledge! Thank you lovely!! Double whoops… The sunnies are new, £12 from NEXT!!! Gorgeous outfit Karen & love the pop of colour with your heels. 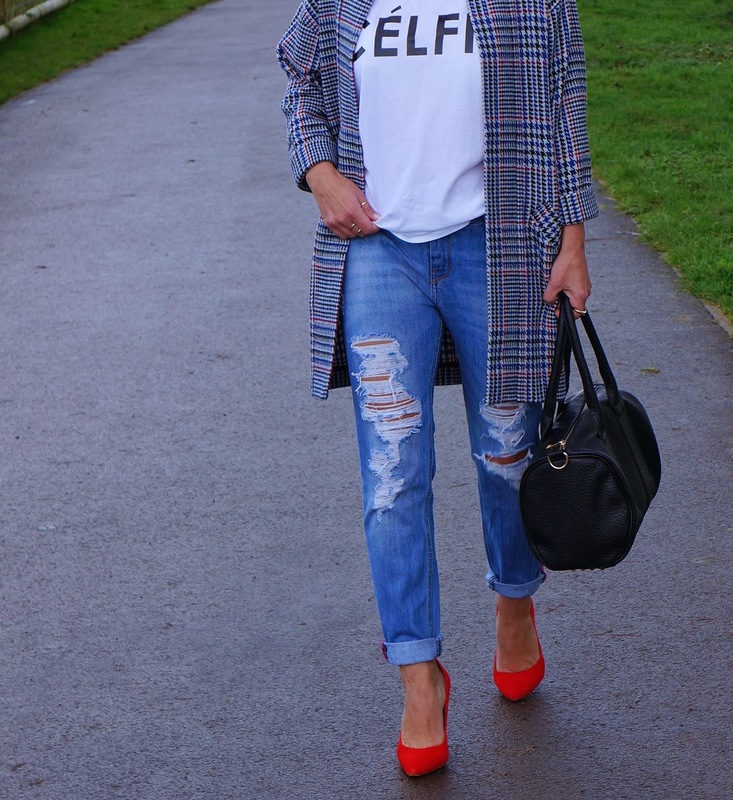 Love this look and your blog :) so glad I found it and now following! Those shoes....Oh they are to die for! Love them. Lovely look, just wanted to ask what size did you get the asos camel coat in? I orderd an 8 as there were no 6s left, hoping it fits as I would like to wear jumpers underneath too.